Anumuthu Chinnaraj spent 3 days begging in streets0. Anumuthu Chinnaraj (far right) on a street in Thiruvananthapuram. 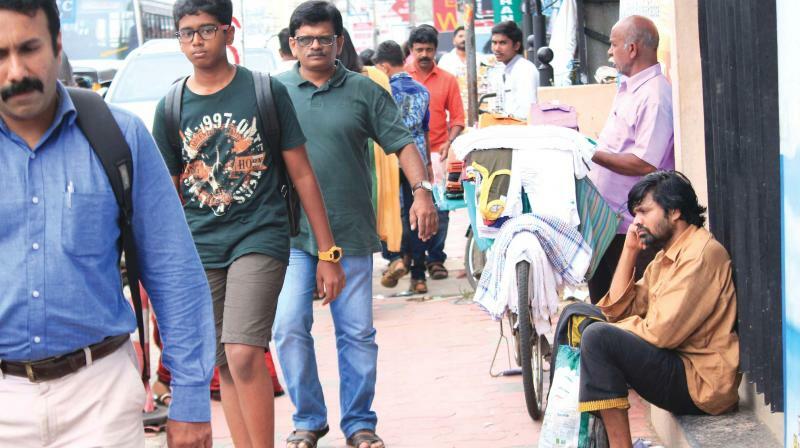 Thiruvananthapuram: Anumuthu Chinnaraj from Pondicherry had a harrowing time as a beggar in the city streets for three days from Friday to Sunday. His experiences were an eyeopener for all the prospective beggars and social workers as well. Chinnaraj is, in fact, a social worker who wanted to know for himself how the destitutes here fare. He is in the city to take part in the training programme organised by ‘Kanthari,’ an education and training institute for change makers at Vellayani on the outskirts of the city. His first day out was in front of a temple, where many people came to offer coconuts, but none even noticed him. Finally, the priest offered him a piece of coconut when he begged. That was the only food he had the whole day as he did not carry any money with him and wanted to use the alms he could collect. So he virtually starved like so many unfortunate destitutes whom the people shun. He was at the railway station the second day and collected `21 with which he bought a cup of tea. But when he noticed a person with mental issues, he offered half of it to him. On the third day, he sat in front of a church where he got Rs 30 from three persons who gave `10 each. “The three days of street life taught me that persons with mental issues and old men hardly get any money through begging to sustain themselves. Only those with ‘professional’ begging skills could earn enough to make both ends meet,” he said. Chinnaraj will deliver a talk on his experiences at the Kanthari programme scheduled to be held at coop bank towers here on December 12 and 13. Chinnaraj was born in a poor family and worked as a child labourer at the age of seven after the death of his father. The ordeal continued until a Catholic priest found him and educated him. He completed a course in electrical engineering and studied photography. While working as a photographer with an advertisement agency, he launched the NGO ‘Snehan’ seven years ago. He left the job three years ago and became a fulltime social worker helping the rehabilitation of destitutes. Chinnaraj wanted to empower people in the streets of Pondicherry by engaging them in poultry, organic vegetable cultivation and goat rearing. He also hoped to open stores selling chicken, vegetable and goats providing sustainable income for the rehabilitated destitutes.